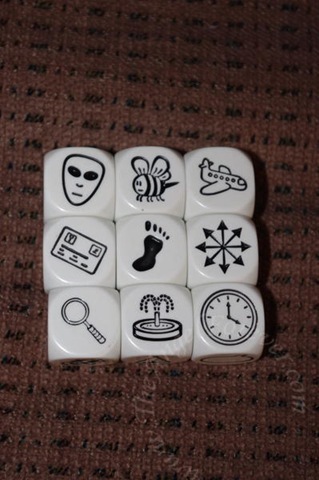 Once upon a time, there was an alien who took his pet bee on an airplane. They had received a post card from the alien’s good friend Bigfoot. They tried to find Bigfoot’s home but turned in the wrong direction and got lost. They looked all over and finally found the fountain in front of Bigfoot’s cave. They were just in time for his birthday party. The End. No, this isn’t part of a great piece of literature. This is a story that I just made up. Don’t worry. I’m not reviewing my own stories. I’m reviewing *how* I made this story up. 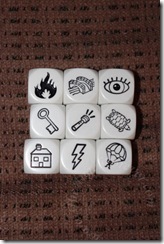 I used nine small dice called Rory’s Story Cubes. The genius here is that this prompts kids (and, let’s face it, grown ups) to exercise their imaginations. 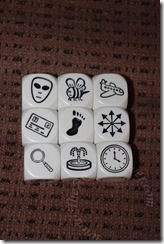 Each roll of the dice results in a different set of images. Since there are over 10 million possible combinations, you could play for years without repeating the same story twice. Even if you rolled the same images twice, a simple shift in the order you put them in or interpretation of the images can drastically change the story. This can also be used to help kids practice their writing. As you saw above, my story wasn’t long. Less than 70 words (and I purposefully lengthened it). At this length, it shouldn’t intimidate early writers at all. A child could think up their story and practice writing it out with no problem. In fact, children might be more motivated to write their own stories than to write answers to questions or copy printed texts. Now, what story can you make up using these pictures? Leave your story in the comments below. Let’s see how many different stories we can get from the same nine images. Want to see and hear what NHL thought of Rory’s Story Cubes? Head on over to TechyDad.com to see his video review. 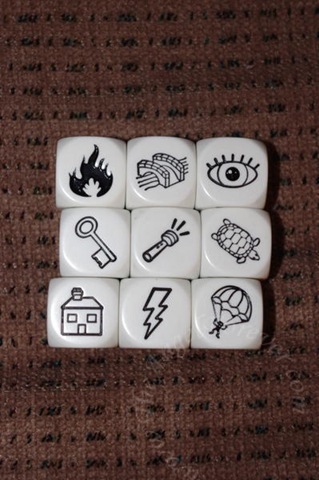 Disclosure: Our son picked out Rory’s Story Cubes while shopping at a local book store. He thought they looked like fun and used a gift card that he had received for Passover to purchase it. All opinions are our own and no compensation was given. 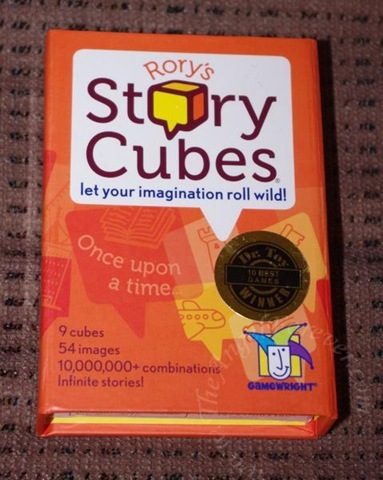 One widget within the review is for my Amazon Affiliate where I will receive a percentage of money for the sale should you opt to buy Rory’s Story Cubes. Note from TheAngelForever – as a teacher this would be a great classroom gift to send to your child’s teacher.